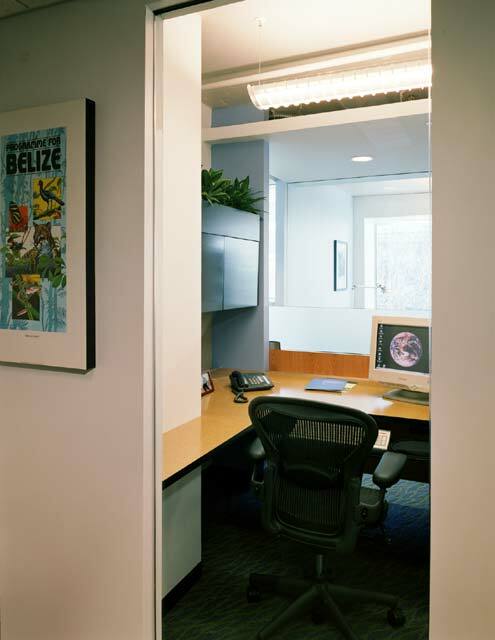 Washington, DC: An environmental organization doesn't give up having a beautiful space just so it can be "green." UPDATE: January 2005 � This project was recently awarded a Silver Rating under the U.S. Green Building Council�s LEED Commercial Interiors Pilot Rating System. 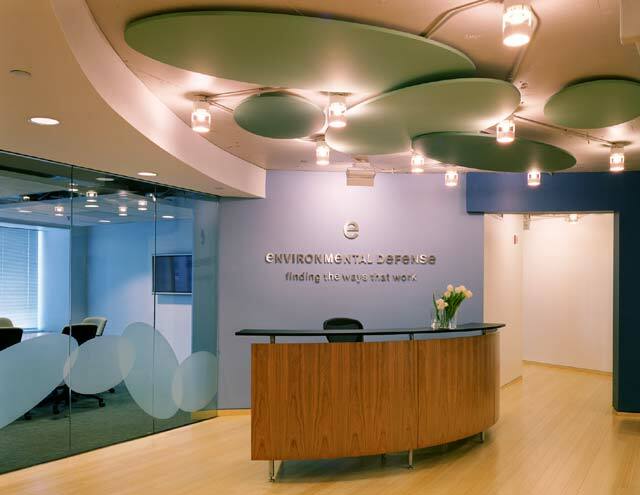 Environmental Defense is a nationally recognized environmental organization known for its ability to work closely with major corporations in developing environmentally responsible solutions to problems. 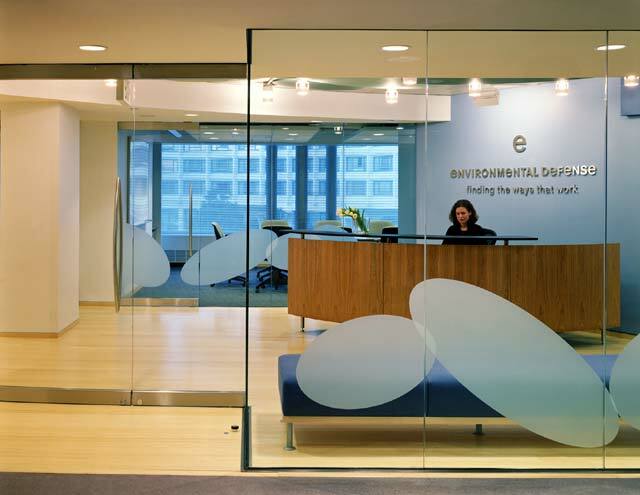 The client charged Envision Design to create its Washington, DC, office as a model for the organization�s environmental values. 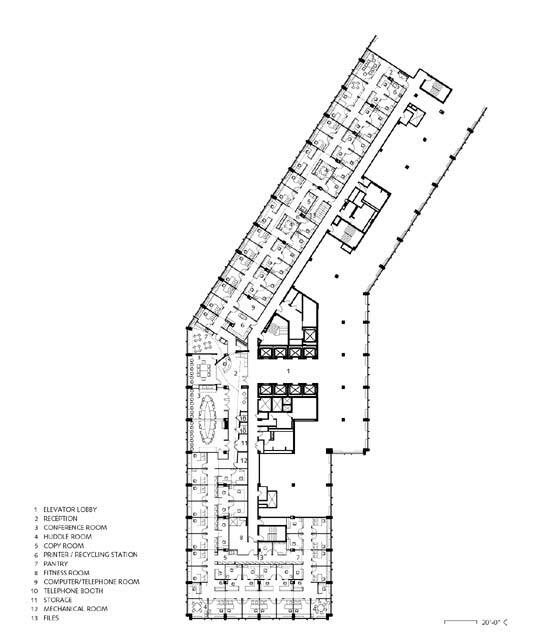 The 16,144-square-foot space on the sixth floor in an existing high-rise is filled with natural light, healthy for the staff, built on a reasonable budget � and has minimal impact on the environment. From the moment visitors arrive in the elevator lobby, there are views through the space to the outside. 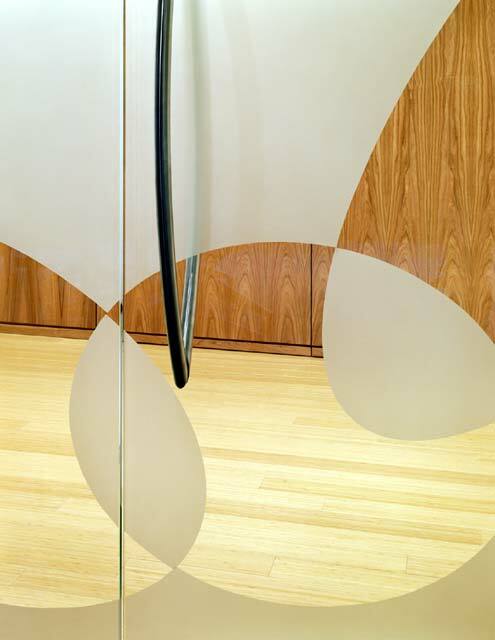 Playful elliptical forms on the lower half of glass doors at the entrance and on the conference room doors serve several purposes. �In a space with so much floor to ceiling glass, it was important to mark the glass is some way for safety reasons,� Wilson explains. �We also wanted to cover up the cluttered look of conference chair casters and the like.� The ellipses came out of the idea of creating organic imagery without being literal, like dolphins or butterflies. 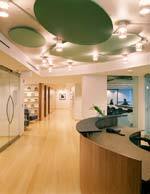 �The shapes are whatever you want them to be,� says Wilson.� �Some people see petals, some see lily pads, and some see cells.� Ellipses made of agriboard are repeated in various shapes and sizes, and attached randomly to the exposed painted ceiling in the reception area. 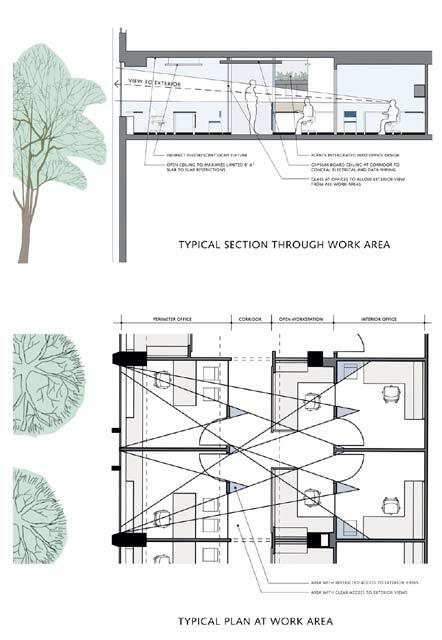 Among the challenges to the design team were the long, narrow proportions of the space, and extremely low ceiling heights (only 8� feet slab to slab). 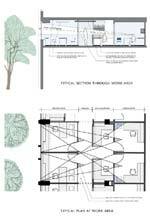 In addition, the program required spatial efficiency and flexibility within a compact plan. Workspaces are standardized in three identical types: perimeter offices (120 square feet), open workstations (56 square feet), and interior offices (100 square feet). 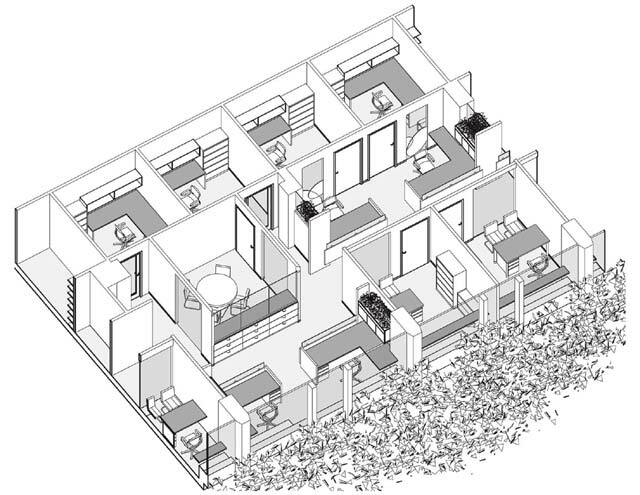 As various programs grow or contract, offices within the same type are interchangeable. 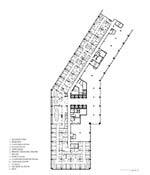 Additionally, 120-square-foot �huddle rooms� are sized to become offices if need be. 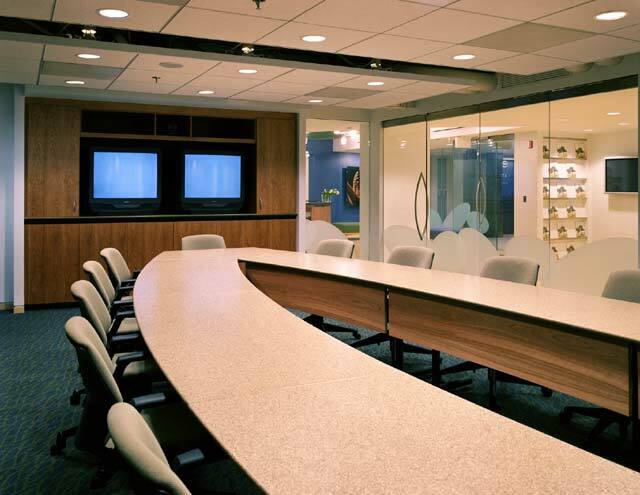 The large conference room may be sub-divided into separate rooms with an acoustically rated operable partition. One side of the room has predominately clear glass doors, and the other side has mostly translucent doors for privacy. A series of full height glass panels pivot open to the reception area to allow free flow of people between the two spaces during large gatherings. The custom designed sectional conference table can be arranged in a variety of configurations. The modesty panels are removable and table legs fold flat for easy storage. 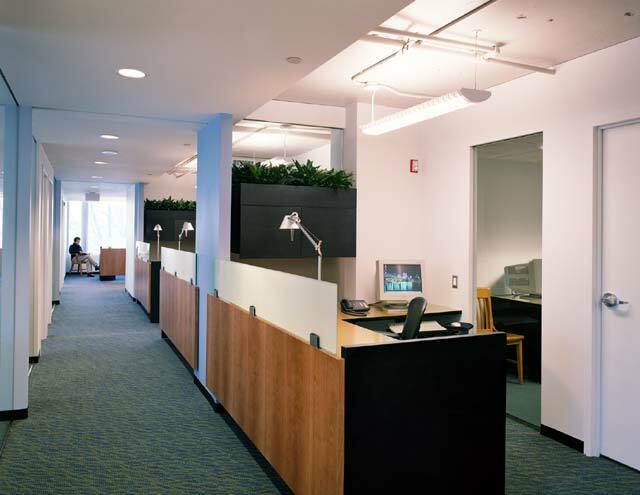 Energy efficient fluorescent lighting used throughout and occupancy sensors in all offices reduce energy consumption. Carbon dioxide sensors monitor air quality and special filters remove off-gassing from copy machines. Recycling stations are placed in multiple locations. 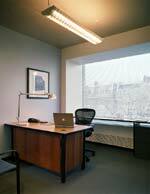 The office is located in the Kalorama area of the District, a high-density urban environment, with hotels, conference centers, restaurants, retail stores, a post office, movie theaters, galleries, nightlife, health club, and housing located within a one-block radius. Multiple bus lines stop in front of the building, and there�s an underground Metro Rail station within one-half mile. The building offers bicycle storage, and a shower facility is provided within tenant space. 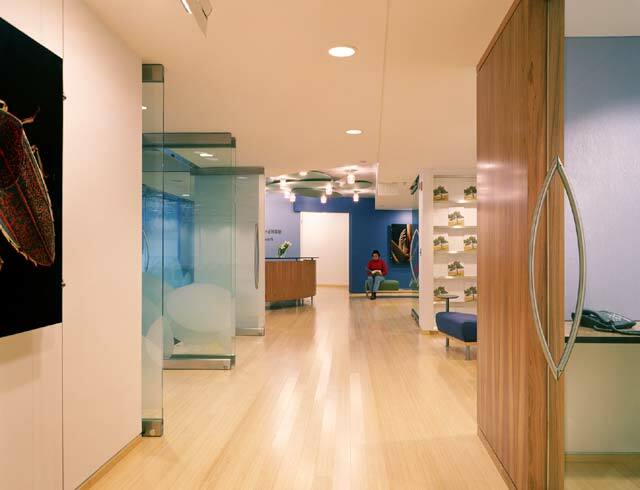 The project was completed in January 2002, and is under consideration to be one of the first pilot projects for the new LEED Commercial Interiors Rating System. MEP Engineer/ Audio/Visual Designer: GHT, Ltd.
Envision Design was founded in 1999 by Ken Wilson, AIA, and through a partnership with Diana Horvat, the firm has grown to a staff of 21. 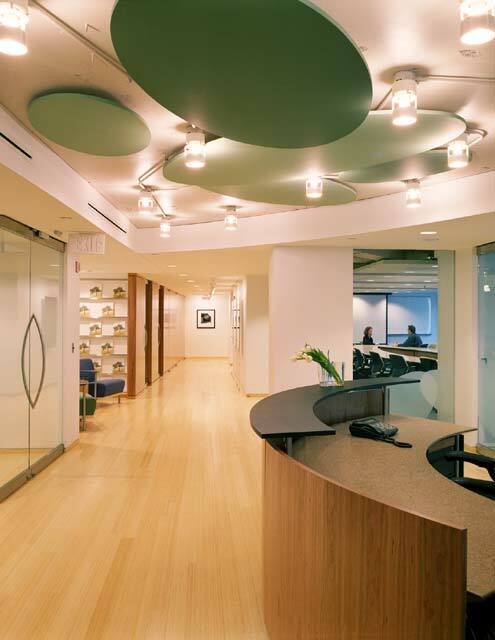 Based in Washington, DC, the diversified practice works nationally on commercial interiors, retail/entertainment, building renovation, and new base building construction, with a committed focus on sustainable design. From the elevator lobby, the transparency of the Environmental Defense office is obvious. Organic forms are etched in glass doors and float from the ceiling. 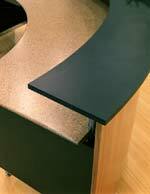 The custom reception desk is made of bio-composite panel material containing sunflower seed hulls, FSC certified cherry veneer on agriboard front panels, and transaction ledge of wood resin. View from corridor to reception area: doors on conference rooms pivot open to enlarge the space for gatherings. The sectional conference room table can be easily reconfigured (and stored). 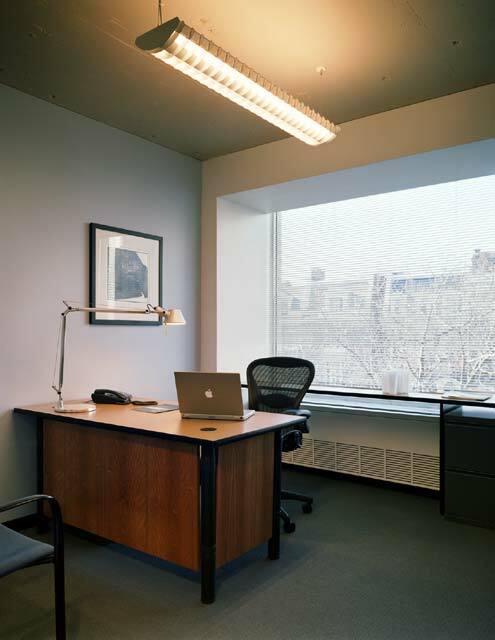 Typical interior office: full-height glass wall offers natural light and views to the outside. Workstations have agriboard tops, supports, and overhead cabinets with a zero VOC finish system that is UV cured.